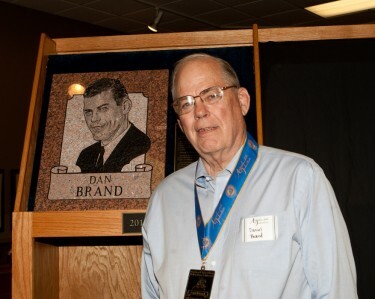 The National Wrestling Hall of Fame has learned that Dan Brand passed away in California on February 10. He is survived by his wife, LeNette, children and grandchildren. Brand was inducted as a Distinguished Member in the Hall of Fame’s Class of 2011. Although his high school athletic career included only successful stints in football, baseball, and track, he later achieved his highest success in international wrestling. Brand developed his wrestling skills at the University of Nebraska under the tutelage of Don Strasheim and Hall of Fame Distinguished Member Bill Smith. His Cornhusker career included a season on the freshman basketball team, three seasons on the varsity wrestling team and a fourth-place finish in the heavyweight division at the 1958 NCAA tournament as a senior. Although his athletic career at Nebraska was a success, it was just the beginning. Turning his focus to international wrestling, Brand won the 1960 United States Olympic Trials in freestyle, and placed fifth at the Rome Olympics. But the next year, Dan Brand forged a new path for his country. The United States entered the World Championships for the first time in 1961, and Brand took advantage of the opportunity. He won the National AAU tournament in freestyle and Greco-Roman, then wrestled in both divisions at the World Championships. The former Nebraska star placed fourth in freestyle and fifth in Greco-Roman. The next three years would include many victories. Brand won the National AAU tournament five more times: three in freestyle (1962, 1963, and 1964) and two in Greco-Roman (1962 and 1963). Winning continued on the international stage as well. Brand earned a bronze medal at the 1962 World championships, joining teammate James Ferguson as the first freestyle World medalists from the United States. In 1963, he qualified for another World team, but did not compete due to injury. However, the apex of Brand’s career came at the 1964 Olympics in Tokyo. His third-place finish at 191.5 pounds was the only wrestling medal for the United States in either style that year.